I just posted my trip report on isocpp.org. Also be sure to read the Current ISO C++ status page. We accomplished a lot last week — thanks to all the volunteers for making this a very productive and successful meeting! 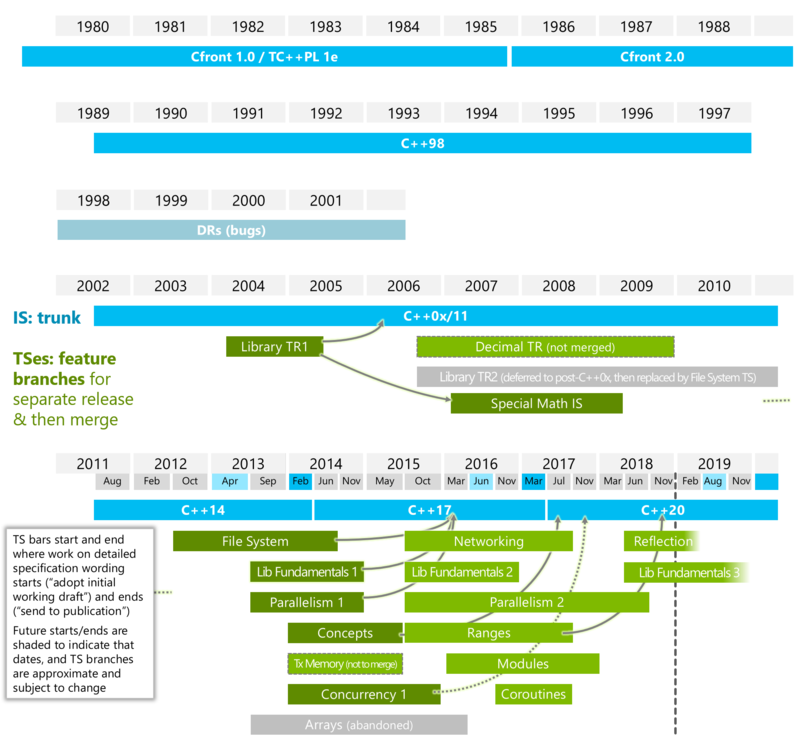 Just to visualize everything that’s going on, here’s a copy of the current ISO C++ timeline… enjoy. Not before visual c++ could support most of the c++11 features. You can follow the graphics discussion group listed at isocpp.org/forums. Is there any way to get involved in the Graphics study group? I was looking forward to std::dynarray a little, but I can see how there is an overlap with runtime sized arrays. However, ould you elaborate on “optional has moved to the Library Fundamental TS.”, what were the issues there? There was a transient glitch (we’re investigating). It’s back up now. @Magnus: Not yet, and probably won’t. The point was to break new-to-me ground — not to write a complete game clone (those already exist so that’s not new), but to see for myself as an existence proof that something interesting can be done in just Standard C++ plus one modern graphics framework from scratch in an afternoon (that *is* new information). Now I know it can. Having already exercised loading and displaying textures and doing drawing, animating the ghosts is just more of the same and so less interesting. However, I would not be surprised if someone else picked up the challenge and wrote a complete PacMan from scratch in a day and possibly even extended the original with cool new features (hint hint). Have you taken it all back? All three major links (trip report, status, and timeline img) give 404s. The TS’s shown in the graphic are just the ones that are currently actively open and have (or will soon have) working papers with standardese wording — even showing only the near-term work items due for completion in the next 12-24 months is getting pretty crowded! I used to show TM and other future TS’s in the graphic, and we still expect them, but there are now so many near-term ones that I trimmed the list for space to just the actual open projects, and will add the others as they reach the stage of having a working draft. At the Chicago meeting there was discussion of other SG work, including modules and transactional memory and graphics and other work. Those proposals are not yet far enough along to be in working drafts yet, though I expect we’ll see more of them reach that stage in the next few meetings.